KFTC member and Kentucky author Silas House published a young adult novel in 2012 called Same Sun Here, a collaboration with New York City author Neela Vaswani. The book is a series of letters between River Dean Justice, who lives in eastern Kentucky, and a girl named Meena, who lives in New York City. House talked with KFTC recently about the book. This past weekend, the Madison County chapter raised money in style. 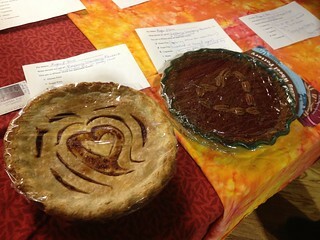 At the chapter’s annual Pie Auction, held in the basement of Union Church in Berea, chapter members brought pies to be auctioned off to raise money for KFTC’s citizen lobbying efforts. This year, KFTC split the proceeds with the West Virginia Water Project, an organization created to deliver water to the people whose drinking water was poisoned by the recent chemical spill around the state capital of Charleston. Happy Pi(e) Day to all! For those who don't remember from their school days, Pi is a math term that has an infinite number of digits, but is approximately 3.14, so March 14 is known as Pi Day. There are plenty of ways to celebrate, but many festivities involve eating delicious pie, and that's just what the Madison County KFTC chapter will do next week when it holds its annual Pie Auction event in Berea. Last week, I began my internship with the Madison County chapter of KFTC. I am currently a student at Eastern Kentucky University, where I will complete my B.A. in their Criminal Justice next semester. As I am one of a seemingly small minority in that program that does not intend to seek employment in a law enforcement career, but would rather find a more social justice focused vocation, I find that KFTC and I share a great many ideas and opinions on our current criminal justice system. In this blog entry I hope to show exactly what the average lobbyist experiences, and what anyone can help to accomplish by joining an organization like KFTC.